Is there such a thing as “French philosophy”? Or is philosophy a purely universal discipline, raising the same abstract questions no matter whether the philosopher is Chinese, English, French, or Brazilian? One way to address this question is to consider the collective intellectual practice of “philosophy” from the point of view of sociology — that is to say, historically and empirically. Jean-Louis Fabiani’s book Qu’est-ce qu’un philosophe français? (which was released in France this week) addresses this question from the point of view of sociology, and it provides a fascinating and innovative approach to the history of philosophy. (Here is a link to Fabiani’s academic bio.) 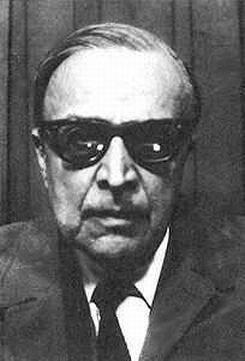 Fabiani was a student of Bourdieu, and he approaches philosophy in something like the way that other sociologists have approached the study of science: as a socially situated intellectual activity which is amenable to sociological analysis and explication. The fact that it is intellectual implies that there is an internal logic to the development of the discourse; organized thinking moves it forward. And the fact it is situated implies that philosophy is conditioned and motivated by social circumstances external to the philosophical community. Fabiani attempts to steer a highly original course between the idea that social context determines the content of a specific philosophical tradition, and the idea that philosophy develops wholly and solely according to its own internal intellectual logic. Crude sociology of knowledge falls in the first camp, and traditional history of philosophy often appears to fall in the second camp. Fabiani takes an approach that allows both for social influence on philosophy as well as critical, rigorous logical analysis and thought wielding its influence. Philosophy is never limited to a collection of texts, knitted together by the threads of tradition. It also includes material objects, spaces and social practices. It includes all types of reception, including the less orthodox. As with any other type of work, philosophical texts imply different types of appropriation in space and time, and exist only through the successive pacts of reception that constitute them as valued objects in a particular culture. I wish to analyze philosophy just as what we now call science studies have analyzed processes and controversies in the various scientific disciplines. Science studies have questioned the great epistemological divide which reserved the study of contextual elements for sociologists (institutions, organizations, strategies, etc.) and removed the assertions, demonstrations and the quest for evidence from their purview (except if they are crudely determinist and seek to explain concepts entirely by contexts, to put it simply). What could be interesting about a socio-historical analysis of philosophy? First, we have to suspend our belief — at least for a while, because it is the habitual battleground of the activity — in the existence of an abstract and universal frame for the philosophical debates, this the result of a venerable scholarly tradition. The « relocalization » of philosophical interactions is necessary in order to see that philosophical texts are also performances, not only embodiments and products of lifestyles but also their sources. Studying philosophy by means of sociological methods would appear to be one of the most important challenges for the social sciences today. « The queen of disciplines,» as it is called in France (or the crown–or crowning as I once described it years ago) has long resisted any attempt at objectivation. Although the most general objection to the ascription of social determinants in the shaping of social thought are now superannuated, the explanatory power of theories applied to the field of intellectual production still remains quite limited. The modes of categorization applied to products and to individual intellectual strategies are too crude and their use too poorly controlled; we no longer take for granted that society as such can be read (at least in a cryptic language) through symbolic production. 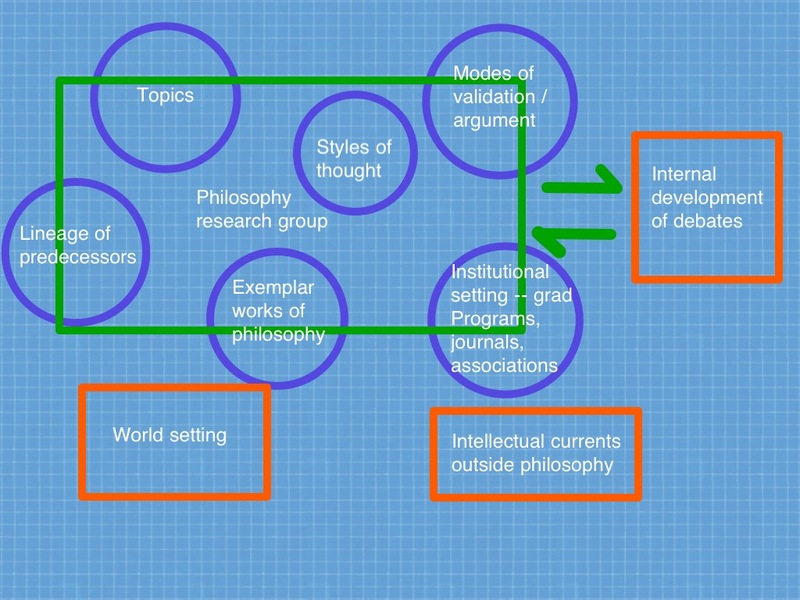 The diagram is intended to be a way of visualizing a philosophy research tradition at a moment in time. The unit of production, the philosophy research group, is steeped in a conventional specification of the important topics; it is skilled in a specific set of modes of argument; it holds out a set of exemplary philosophical works from the history of the discipline as currently understood; it operates in a space that may include other research groups pursuing different topics and methods; and it functions within a set of institutions — graduate programs, journals, tenure processes, associations, prizes — that train, valorize, and rank various individuals and their products. Each aspect of these “internal” features is amenable to concrete historical and sociological investigation; we can seek to trace out the institutions, discover the order and rationale of the topics, etc. External to these factors are circumstances in history and current social life (World War I, the Holocaust, the Civil Rights movement), and intellectual currents from outside the discipline (Freudianism, for example), that exercise influence on the development of philosophical positions and frameworks. The social context draws attention to (or away from) certain topics; context also sometimes provides institutional constraints that favor or disfavor some positions. (For example, McCarthyism and the Cold War created constraints and incentives that greatly deformed the course of research in the humanities and the social sciences.) The intellectual activities of the current research groups lead to a degree of development of the ideas, positions, and schools of philosophy at a given moment in time. So the received setting, external environment, and application of modes of invention and argument drive forward new philosophical content, and the institutions of the profession attach credibility/lack of credibility and prestige/scorn to the results. The diagram indicates as well several ways in which a philosophical tradition might possess a distinctive, national character. The list of valued topics may differ across national traditions; likewise the styles of reasoning and modes of argument; and different traditions may valorize very different bodies of predecessors as well. So it is fairly evident that Fabiani’s question warrants a “yes” — there are distinguishing characteristics or signatures across traditions of philosophy. And even when the topics and questions appear similar — the focus on the conditions of knowledge in common between British and French philosophy in the 17th century, for example– the styles of thinking, modes of reasoning, and examples of good solutions still differ widely. Should we think of these differences as defining distinct paradigms of philosophy? I’m inclined to use a different term — perhaps “research tradition” — to suggest a high degree of variation within a national tradition of philosophy. Like other areas of humanities production, it seems to me that the standards and exemplars that hold together “analytic philosophy” or “hermeneutic philosophy” are much looser and less prescriptive than their counterparts in the natural sciences. So the term “paradigm” does not fit the framing of philosophy in context very well. Chapitre 7 – La religion ddans les limites de la simple raison? Interesting post. As a former philosophy prof that did grad work at a school emphasizing the historical approach, it appears to me that most philosophical options were already at least inchoate in the Greeks, whose range of thinking was broad. Nevertheless, we associate Greek philosophy rightly with Plato and Aristotle, since their subsequent influence was a determining factor in the development not only of Western philosophy but also Western civilization through its adoption by influential Christian theologians like Augustine and Aquinas.Similarly, most societies and cultures have had a broad approach to philosophy, but the culture itself is characterized by the most influential thinkers. As a consequence other thinkers are marginalized and considered "lesser," even though they may have been highly original and even profound. But they were out of synch with the times.British thought is considered to be chiefly realistic (Locke) and empirical (Hume), although it also contains some of the great idealists, Berkeley, Bradely and McTaggart, for instance, who go mostly unnoticed other than by specialists.French philosophy is dominated by Descartes, hence, is considered primarily rationalistic, even though Compte spawned positivism, which caught on elsewhere.Again, America philosophy is characterized as pragmatic owing to the predominant influence of James and Dewey, even though it produced influential idealists like Emerson and Royce, and process thinkers like like Hartshorn and Weiss. But what characterizes American thought is its focus on experience, which is a chief feature of the culture.So I would say that philosophy is both influenced by and influences society. Most societies produce a wide range of thinking, but certain focuses characterize the culture, at least over extended periods, with philosophy feeding culture and culture feeding back on philosophy. One could say with Hegel, that ideas are implicit until they are made explicit through action. Many ideas remain implicit and only the one that percolate to the top become explicit. Do ideas come from the blue or do they arise from the culture? Probably some of both. Human beings cannot stand outside the process to see since we are social animals as well as rational ones.I experienced this first hand, for example. I wrote a dissertation on a hot topic, so to speak, not only because I was interested in it but also because it was to the fore in the academic universe of discourse and my advisor was, I thought, the best one to work with. But in the end, I chose to specialize in a marginal area in which I was particularly interested. There are a good many of us out on the periphery. While we think of ourselves as American philosophers, too, we don't expect any recognition anytime soon, since we are working too far removed from the prevailing universe of discourse that underlies cultural conventions and social institutions.That is a choice whose origin is difficult to grasp. I call it "interest." One is impelled to act on one's dominant interest. The East would explain this as the result of latent impressions of past lifetimes, of which most of us are not aware. In the West, it is called "fate." Personally I feel that different perspectives of philosophy matter a lot when we look through different logic in different cultural philosophies. It seems that when perspectives change, the whole foundation of philosophy changes. Philosophies across countries might be similar to building styles across countries. Each style is valid, but different.